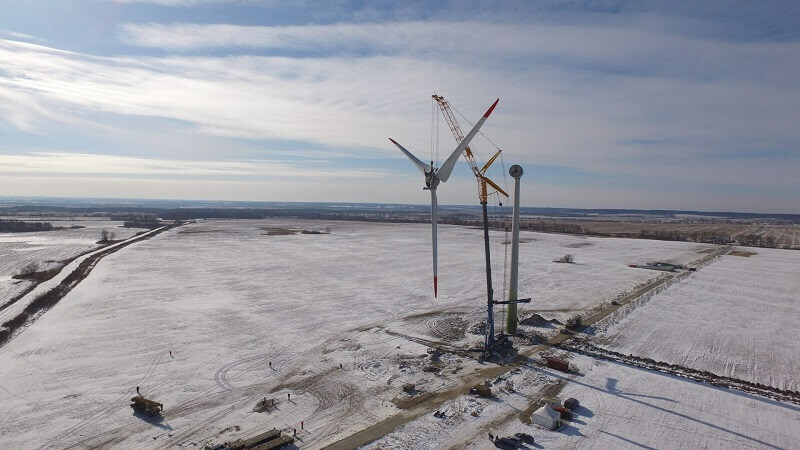 Not far from the village Ushakovo, 20 kilometers from Kaliningrad, Russia, the Sarens (RAWI member) team in March 2018 completed the mechanical installation of three Enercon E-70s with a capacity of 2.3 MW each. For the installation of these WTG, the Liebherr LTM-1750-9.1 crane with a lifting capacity of 750 tons was used. As a subsidiary crane, a Terex Demag crane with a load capacity of 200 tons was used. The installation of the turbine was carried out in several stages. First, a base ring with a weight of 17.8 tons. Then electric modules were installed. The following modules, 3 sections with a weight of 54, 38, 42 tons, respectively, were raised and mounted. After all the sections were installed, a Nacelle weighing 19 tons and a generator weighing 52 tons were mounted at a height of 65 meters. Further on, a rotor with blades was assembled. The length of one such blade is 35 meters. At the final stage, using 2 hooks, a rotor assembly with 51-ton blades was raised and mounted. The project was carried out in hard weather conditions. The mark of the thermometer often fell below -18, regular winds above 10 m/s. ⟵Член РАВИ Sarens выполнил монтаж 3 ВЭУ Enercon E-70 неподалеку от Калининграда.